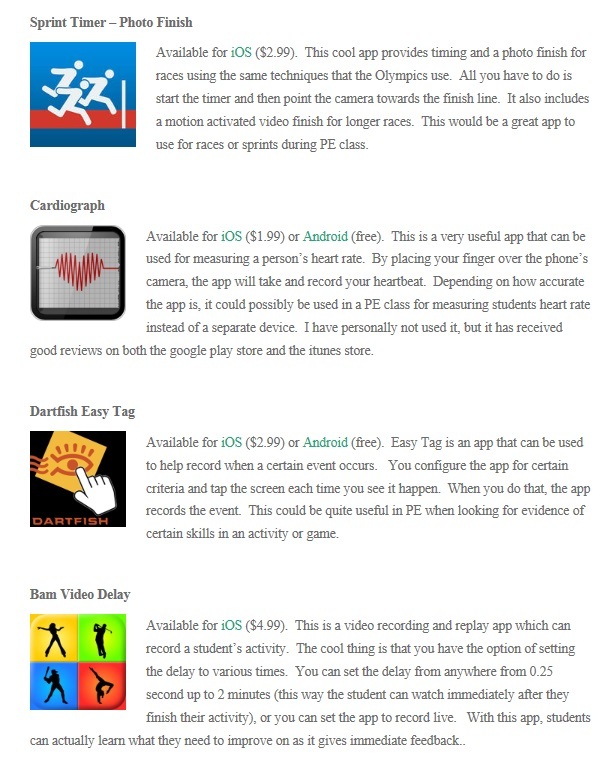 IT IS NOT a PE requirement for students to download and use any of these Apps. This is just a resource to assist students in improving their Fitness levels and track their progress. It is understandable that not all students will have access to their own cellphones or tablets and by no means is it necessary or required to purchase a phone or a tablet for students. However if students do have phones or tablets or if their parent can help them with Apps with using theirs, there are many good Apps that can be downloaded that can assist the student (and parent) in keeping track of their progress in their physical activities and Healthy Eating activities. 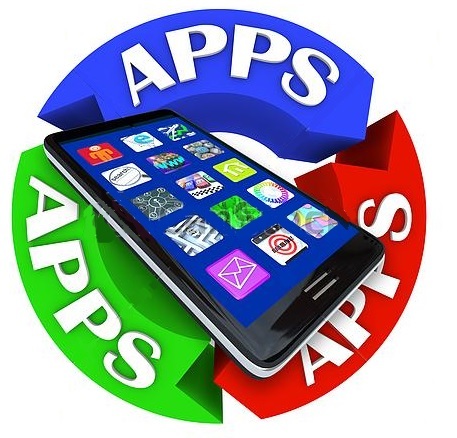 Some of the Apps are more geared toward older students or adults. But SPN parents can demonstrate how they can be a great role model by focusing on their own fitness and wellness level. in tracking overall fitness and wellness. This list was developed from an internet search for fitness related apps. * The description for each app was copied from that search. More Apps will be added to this list. • iFitness HD An exercise companion app. Provides over 330 exercise images and full text descriptions. Allows tracking of progress for multiple users. Users create customized workouts. • Nutrition Tips This app gives you hundreds of interesting and useful nutrition tips and nutritional health facts — concisely written for quick and easy review.. Referenced from Nutrition.gov, USDA.gov, and the Food and Nutrition Information Center, some of the most prominent leaders in food & human nutrition information! • Coach’s Eye Videos students performing a skill. Then, play it back in slow-mo, backward, or frame by frame. You can draw and record a playback with verbal comments. Overall, a really great app for skill assessment allowing instant feedback for students. • Team Shake Team Shake is the technological and environmentally friendly way to choose teams. Instead of a hat and scraps of paper, the user enters his friends’ names in his iPhone and gives it a shake. The screen will then display a random set of color-coded teams. These teams can immediately be used for game play or saved via email. Team Shake is great for making teams for board games and sporting events. It’s also a very useful tool for teachers who need to create groups for projects! • StopWatch This stopwatch shows time on a digital display as well as on an analog clock face. The analog clock face is easy to collect information from during timing of a physical activity task or test. After the timing has finished, it is most convenient to read the precise time from the digital display. • Giant Scoreboard A generic scoreboard, featuring: Timer/Countdown (editable); Team names (editable); Giant digits, visible from 50ft; Fits any sport; Simple, accurate and reliable. • Pocket First Aid & CPR from the American Heart Association Pocket First Aid & CPR from the American Heart Association helps save a life in Haiti. Read the incredible story of Dan Woolley, who survived 65 hours under rubble using this application. As seen on CNN, NBC Nightly News, Fox News, London Daily Mail, NPR, and many more. • Pocket Body A fully searchable interactive atlas of the human body. • Pocket Heart (iPad App) Interactive educational App to show how the human heart works in 3D. A great learning tool for cardiac anatomy and physiology. • Teacher’s Assistant Teachers can keep track of student actions, behavior, infractions, and achievements in the classroom. This improves communicate quickly and easily with parents and administrators by documenting student classroom habits and behaviors and sending reports via email or making a call right from an iPhone. 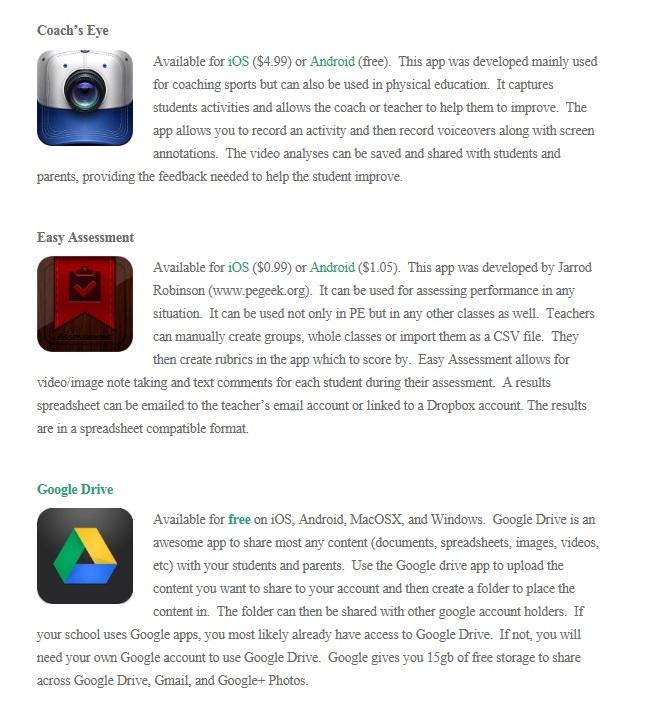 • Easy Assessment Easy Assessment is the app teachers, trainers and coaches have been waiting for. A simple way to capture and assess performance in any context or situation. Experience a new level of efficiency. • Timer Tools You get a suite of timers that are super easy to use. Timers include: Countdown, Stop Watch, Turn Timer, Seconds Up, Seconds Down, and Interval Timer. Access and set any timer with just a few clicks. • Teacher’s Roll Call Teacher’s Roll Call helps classroom instructors at any level track student attendance. The app is designed to make data entry and management quick and efficient so you have more time to focus on actual teaching. • Class Cards After entering the names of your students this app will display a randomly generated list of students. The list will not only show you the name of the student to call upon but will also show the names of the next four students to call upon. • Bracketmaker This is a great portable program to help you create brackets for tournaments. Able to customize team names for up to 32 teams. • MusicWorkout A unique interval timer that utilizes your music to inform you when it’s time to rest and time to work. Perfect for teachers, coaches, trainers and those looking to improve their fitness. Simply set the work and rest duration, along with the number of sets to begin your workout. • Numbers Numbers is the spreadsheet application for iPad. This App is needed to utilize SPARK iPad Rubrics. • Educareations Educreations turns your iPad into a recordable whiteboard. Diagram a sports plays through voice recording, realistic digital ink, photo imports, and simple sharing through email, Facebook or Twitter. • Fotobabble Fotobabble lets you capture moments in real-time and share with your audience via email, Facebook or Twitter. Fotobabble is faster than video, easier than typing, and more engaging descriptive than sending a picture alone. • Snap Guide Snapguide is a simple way to share and view step-by-step how to guides. Students can show skill progression or demonstrate the rules of a game by creating their own guides and share through email, Twitter, Facebook and more. • Whiteboard VGA Whiteboard offers real-time collaborative teaching tool. Connect with any iPad, iPhone, iPod touch, or Mac over Wi-Fi, to draw pictures and customize a demonstration. Allows you to import your own pictures to display. • Beep Test (PACER Test) The beep test (also known as the pacer test and shuttle run test) is a standard fitness test used by professionals to test cardiovascular fitness. The beep test involves running back and forth between two markers at an increasing pace as indicated by audio beeps. Your fitness level will then be calculated based on how long you can keep the pace. • Cardiograph Cardiograph is an application, which measures your heart rate. You can save your results for future reference, and even keep track of multiple people with individual profiles. • FitnessHD This app provides tools for teachers and students to improve their health by tracking their progress through the calorie counter and body tracker as well as view diagrams and videos of exercises and workouts. • Pedometer Pedometer will work as you walk, run, jog or do your treadmill. The special algorithm – the same as used in hardware pedometers – is implemented in the application.